Water was extremely important to the people of old. Drinking water came from wells and dripping water from the mountains (wakimizu), as in my own home in Japan. We have little crabs living in the well to show us the water is pure and clean. To keep the wells clean was a family event in the beginning of summer, before the rainy season started and the wells were still rather dry. 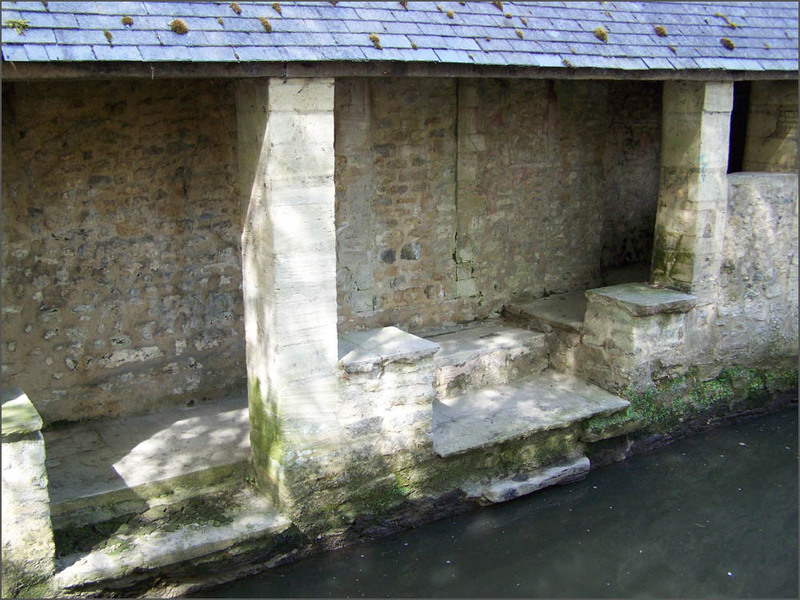 The water was drained and then one family member,usually one of the sons, climbed into the well on a rope and cleaned it from leaves and sand that had fallen in during the year. A well could be more than four meters deep and quite dark at the bottom. It would take more than an hour to empty it, bucket by bucket, of all the water. Then the sludge was scooped up from the bottom carefully, whilest the fresh water was already gushing forth from the inlet. When all was done, a bottle of purifying rice wine for the God of Water would be left and the water allowed to flow back. To perform this hard work was quite refreshing, still, on a hot summer day. After the well was cleaned and started to fill up again, mother would cook some festive rice with red beans (sekihan) and the family celebrated the new clean water. To prevent the spread of malaria and other diseases, the trenches and water ways in the towns and the countrysied were cleaned around the eighty-eighth day from the beginning of spring (hachijuuhachiya, hachijuuhachi ya) or on the day of the local tutelary deity (ujigami) of a community. After this communal event, all celebrated with food and ricewine (irooen 尉労宴). After a period of long rain during the rainy season, the well water would change its color and sometimes becomes unsuited for drinking water. A well that is trickeling even in a severe drought. Drinking water was most important to the farmers of old. The wells were not dug in the ground but water from a river or public waterway (for example Tamagawa Josui 玉川上水) was let through wooden pipes (kidoi 木樋) to a huge tank under ground, where the people could take it out for their daily use.
. The Water Supply of Edo .
. kami no i 神の井 well of the deity, sacred well . In Japanese, a "frog in a well" (sei-a 井蛙) is a narrow-minded person. But this frog is out of its well at last, seeing the great world! mein Brunnen gibt kaum Wasser.
. sentaku 洗濯 washing, doing the laundry in Edo . with laughs from the past. Thank you, gabi san for your information about well in Edo era tha are interest as well as useful. Gabi, thanks for posting these comments on Issa's haiku. The context you provide enriches the experience. In Oman, virtually everybody has a back yard or front yard well cleaning them is a major effort. usually when it is about 50+ degrees C outside. In this kind of work, the men only wear a thin cotton wazir, about 2x1 meters of pure cotton cloth, with very narrow (1cm) bright red, green, blue and orange dyed or embroidered striping on the long edges and each side and decorative knots on the short side where the cloth is cut. if the muck is really awful, they tuck it up like in an indian village. most wells are deep and quite cold at the bottom. Sacred rice wine has been left as an offering next to a drained well. at the imperial shrine . . . This hokku is from lunar 1/7 at New Year's in 1807, when Issa was living in a rural area at the edge of the city of Edo. Warblers (uguisu) have begun to return to the area, and the villagers treat them as honored travelers coming home again. Hearing the first warbler song of the year was a big event, and many people placed seeds and other food just outside their houses to attract warblers. In the hokku one warbler stops at a communal village well or perhaps at the well of an old farmhouse, and a villager gladly waits for the bird to finish drinking some water left on the well curb or in the bucket before she lowers the bucket into the well herself. As is common in hokku, Issa doesn't specify the subject of the verb ('to draw water'), presumably because she or he is obvious, and I use a female pronoun since drawing water was mainly considered women's work, though it also could be done by a man. And since the language seems objective, I take the hokku to be in the third person. The image of an "old" well suggests that people in the village still keep many old customs, including respect for nature and a willingness to share resources with other creatures, even though the village is not far from the city streets of Edo. In Japanese, the verb kumu, 'to draw water,' also has the common meaning of to "dip into" -- to sympathize with or share -- others' feelings and thoughts, and Issa may well be suggesting that the villagers share many wet, permeating feelings with the warblers. Another version begins asagao ya, but I think the above version is more powerful. This summer hokku is from the sixth month (July) of 1822, when Issa was mostly traveling around and staying with students and followers in the area near his hometown. 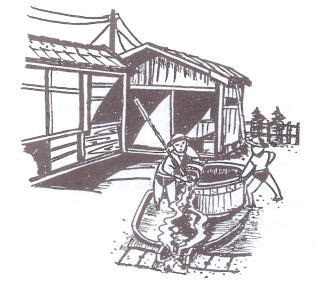 Most traditional Japanese wells were completely drained and their bottoms cleaned of mud, sand, and trash once a year, usually in the sixth month, as in this hokku, or on 7/7, the day of the Star Festival in early autumn. This cleaning was accompanied by a spiritual purification that included rituals and prayers to the god of the well. Well water was important, and these prayers were considered a major ceremony. Most rural wells has fishes in them -- carp or crucian carp were especially welcomed -- and the fishes in a well were believed to be the manifestations of the well god. 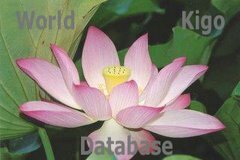 This god protected the purity of the well's water by swimming in it in the form of fishes, so no one was allowed to catch these fishes, and offenders were believed to receive divine punishment. The biggest danger to the fishes was when mud and sand blocked the flow of water into a well or when a well dried up during a drought. In this hokku a day-long well cleaning has finally been completed, probably by a team of specialists at someone's house, possibly Issa's. The fact that even fishes have returned to the well means of course that water has also been allowed into the drained well again, and it seems to imply that moonlight, too, has also returned, reflecting again as before from the surface of the well water. Since Issa can dimly see the fishes swimming in the well, the well may have no roof, or it may may be a public well open on all four sides. This would allow the fishes to be easily visible in the early evening moonlight. The fishes could be either fishes that were in the well before the cleaning or replacements for fishes that had died of natural causes. No doubt like the other villagers, Issa is moved by the sight of the new well water, by the purifying movements of the fishes, who must be happy to be out of a tub and in the well, and by the purity of the light of the moon. Issa's love of and respect for nature and animals have deep roots in the traditional religious and ecological practices of people living in rural villages -- especially in the farm village culture in which he grew up. This hokku is from the middle of the sixth month, or sometime in early August 1822, when Issa was living in his hometown with his wife. Wells were customarily cleaned every year either late in the sixth month or on the day of the Star Festival (7/7). It was a big job, and neighbors usually helped each other out. Perhaps Issa's younger half-brother and some of the tenant farmers farming the rice fields left by Issa's father got together and cleaned the well. First the underground stream was temporarily blocked, and then the well was emptied in order to get rid of all stagnant water. Then, after trash had been cleaned from the sand, gravel, and mud at the bottom, the well was left to dry out before fresh water was allowed to flow into the well. In the hokku the well has been left to dry out overnight. The moonlight must be bright, since even (mo) the bottom of the well can be clearly and completely seen, and it is palpably dry. Issa suggests that simply looking at the bottom of the well makes you feel you are also touching it. Readers can feel this strong sense of presence because Issa uses an onomatopoeic adverb (suppari) that subliminally connotes completeness, cleanness, and clarity as well as feelings of well-being and of being refreshed. The well, after being only partly visible for a whole year, has suddenly become completely dry and visible, and this wholeness gives the viewer a deep feeling of satisfaction with the is-ness of the well. In summer dryness also implies coolness and relaxation, and the syntactical continuity between lines two and three connotes a larger cosmic continuity, with the cool, bright moon penetrating the earth and filling the well with its pure, dry light in a way that suggests the perfection of this common, ordinary well and the readiness of the well to be filled with clean, fresh water the following day. In autumn when the rice is ready for harvest, farmers break the dikes that have kept the fields flooded. Watching the water rush out of the field, Issa bids it farewell as if it is a person, a good example of the comical anthropomorphism for which he is famous.